On April 2nd, the O-RAN Alliance and the Linux Foundation jointly announced the creation of the O-RAN Software Community (O-RAN SC). The O-RAN SC will provide open software aligned with the O-RAN Alliance’s open architecture. As a new open source community under the Linux Foundation, the O-RAN SC is sponsored by the O-RAN Alliance, and together they will develop open source software enabling modular, open, intelligent, efficient, and agile disaggregated radio access networks. The initial set of software projects may include: near-real-time RAN intelligent controller (nRT RIC), non-real-time RAN intelligent controller (NRT RIC), cloudification and virtualization platforms, open central unit (O-CU), open distributed unit (O-DU), and a test and integration effort to provide a working reference implementation. Working with other adjacent open source networking communities, the O-RAN SC will enable collaborative development across the full operator network stack. Background: The telecom industry is experiencing a profound transformation and 5G is expected to radically change how we live, work, and play. This means it’s critical to make network infrastructure commercially available as quickly as possible to ensure business success for operators. It’s time to turn to open source, as it is one of the most efficient ways to accelerate product development in a collaborative and cost-efficient way. The O-RAN Alliance is a world-wide, carrier-led effort to drive new levels of openness in the radio access network of next generation wireless systems. Future RANs will be built on a foundation of virtualized network elements, white-box hardware and standardized interfaces that fully embrace O-RAN’s core principles of intelligence and openness. An ecosystem of innovative new products is already emerging that will form the underpinnings of the multi-vendor, interoperable, autonomous RAN, envisioned by many in the past, but only now enabled by the global industry-wide vision, commitment and leadership of O-RAN Alliance members and contributors. More information about O-RAN can be found at www.o-ran.org. Founded in 2000, the Linux Foundation is supported by more than 1,000 members and is the world’s leading home for collaboration on open source software, open standards, open data, and open hardware. Linux Foundation’s projects are critical to the world’s infrastructure including Linux, Kubernetes, Node.js, and more. The Linux Foundation’s methodology focuses on leveraging best practices and addressing the needs of contributors, users and solution providers to create sustainable models for open collaboration. For more information please visit us at www.linuxfoundation.org. While Open Source Software (e.g. ONAP from ONF, Sonic from OCP) and Hardware (from OCP, TIP, Open RAN consortiums, ONF, etc) for networking is advancing rapidly, Open Networking via SDN, NFV, SD-WAN is really a euphemism for closed networking. That’s because almost all such “Open Networks” are proprietary to either the service provider (e.g. Amazon, Google, AT&T, etc) or SD-WAN vendor (many). Some hyper-scale cloud providers (e.g. Microsoft) use a mix of open source software and purpose built proprietary software. Others (like Amazon and Google) use only their own (proprietary) software. Open Networking hasn’t much of an impact on the enterprise network yet, because of complex support and training issues. It seems like the main beneficiary of open networking will be Facebook (which started the OCP and TIP) and global telcos/ISPs (e.g. Yahoo Japan). Telcos such as AT&T, Verizon, China Mobile, DTK, and others have embraced open source technologies to move faster into the future. And LF Networking is at the heart of this transformation. AT&T seems to be the leading open source software telco. The company contributed their own software on virtual networks as ONAP to the Linux Foundation. The project is now being used by in production by other companies, and AT&T in return is benefiting from the work the competitors are doing to improve the code base. AT&T also led the effort on Project CORD (Central Office Rearchitected as a Data center). CORD combines NFV, SDN, and the elasticity of commodity clouds to bring data center economics and cloud agility to the Telco Central Office. CORD lets the network operator manage their Central Offices using declarative modeling languages for agile, real-time configuration of new customer services. Major service providers like AT&T, SK Telecom, Verizon, China Unicom and NTT Communications are already supporting CORD. AT&T contributed to the Open Networking Foundation (ONF) work on multi-gigabit PON virtual optical line termination hardware abstraction (VOLTHA), which is an open source software stack for PON networks. ONF is now working on integrating the ONAP operating system with multi-gigabit passive optical networks. ONAP was created by the merger of the Open ECOMP platform created by AT&T Labs with a similar, preexisting open source development project. AT&T and the ONF will build on ongoing field trials of XGS-PON technology designed to support speeds up to 10 Gbps. The current XGS-PON trial is testing multi-gigabit high-speed internet traffic and providing AT&T DirecTV NOW video to trial participants. “Collaboration and openness across AT&T, the ONF and VOLTHA teams will be key to bringing this 10 Gbps broadband network to customers faster,” said Igal Elbaz, AT&T senior vice president of wireless network architecture and design, in the press release. “Now that we’ve proven the viability of open access technology in our trials, we can start the integration with our operations and management automation platform – ONAP. ONF also provides a variety of Reference Designs, which are are “blueprints” developed by ONF’s Operator members to address specific use cases for the emerging edge cloud. Each Reference Design is backed by specific network operator partner(s) who plan to deploy these designs into their production networks and will include participation from invited supply chain partners sharing the vision and demonstrating active investment in building open source solutions. The Telecom Infra Project aims to collaborate on building new technologies, examining new business approaches, and spurring investment in the telecom space. TIP Project Groups are divided into three strategic networks areas that collectively make up an end-to-end network: Access, Backhaul, and Core and Management. TIP members include operators, suppliers, developers, systems integrators, startups, and other entities that have joined TIP to build new technologies and develop innovative approaches for deploying telecom network infrastructure. Most telco members are outside the U.S. However, Century Link, Cox Communications, Sprint, and Windstream are U.S. based members. Representatives from Deutsche Telekom, BT, Vodafone, and Telefonica are on the TIP Board of Directors. During his OCP Summit keynote speech, Arpit announced a partnership between OCP and the Linux Foundation to further the development of software and hardware-based open source networking. The organizations will work together to create stronger integration and testing, new open networking features, more scalability, a reduction in CAPEX/OPEX, greater harmonization with switch network operating systems, and increased interoperability for network functions virtualization (NFV) network transformation. Virtualization of network functions and the resulting disaggregation of hardware and software have created interest in open source at both layers. OCP provides an open source option for the hardware layer, and The Linux Foundation’s OPNFV project integrates OCP along with other open source software projects into relevant NFV reference architectures. Given this alignment, OCP and OPNFV already have been collaborating on activities such as plugfests and joint demos. Now they have committed to expanded collaborative efforts which will accelerate the megatrend of totally open networking. The key market disruptors- virtualization of equipment functions, software defined networking and disaggregation of equipment are shown below with the applicable software and hardware entities on the left, and sample open source projects on the right of the figure below. Arpit said the drivers behind this huge move to open source software running on open source hardware are 5G and the Internet of Things (IoT). Mandatory automation of functions (e.g. provisioning and configuration) are (and will be) required to support the high speeds/low latency of 5G and the huge number of IoT endpoints. The Linux Foundation Open Source Networking activities include participants from telecom carriers, cloud computing, and enterprises. As shown in the illustration below, 9 out of 10 of the most important projects of participants will use open source software with all 10 of the largest network equipment vendors actively involved and 60% of global subscribers represented. Shared innovation and a 15 minute “new service creation time” are selected goals of the LFN projects. The .Linux Foundation is leading the way forward to harmonize open source software efforts and get them into the community. In the figure below, the services, software and infrastructure are shown on the left, the various open source projects are shown in the center, and the various standards organizations (but not the actual standards) are shown on the right. It should be duly noted that there are no official standards bodies working on open networking specifications to provide multi-vendor interoperability of exposed interfaces or even APIs within a single piece of equipment. Note: There are more than 20 open source projects for networking currently active at the Linux Foundation (see above illustration). LF also has expanded lately into areas as diverse as software for IoT devices, storage and blockchain. It remains to be seen if the OCP – LNF partnership will create defacto standards (e.g. for virtualization of functions in 5G or IoT) or try to enforce interoperability through certification programs. The current motivation seems to come from carriers like AT&T which are demanding open source software on open source hardware to lower their CAPEX/OPEX and to improve automation of network functions. Mr. Joshipura asserted that the LFN+OCP partnership would produce the very best of Open Source Software & Hardware. The total community collaboration will include: Hardware Vendors + Silicon Vendors + OEM/Manufacturers + Software Vendors, Systems Integrators + End Users. The Telecom Infra Project (TIP) is gaining a lot of awareness and market traction, judging by last week’s very well attended TIP Summit at the Santa Clara Convention Center. The number of telecom network operators presented was very impressive, especially considering that none were from the U.S. with the exception of AT&T, which presented on behalf of the Open Compute Project (OCP) Networking Group. It was announced at the summit that the OCP Networking group had formed an alliance with TIP. The network operators that presented or were panelists included representatives from: Deutsche Telekom AG, Telefonica, BT, MTN Group (Africa), Bharti Airtel LTD (India), Reliance Jio (India), Vodafone, Turkcell (Turkey), Orange, SK Telecom, TIM Brasil, etc. Telecom Italia, NTT, and others were present too. Cable Labs – the R&D arm of the MSOs/cablecos – was represented in a panel where they announced a new TIP Community Lab (details below). Facebook co-founded TIP along with Intel, Nokia, Deutsche Telekom, and SK Telecom at the 2016 Mobile World Congress event. Like the OCP (also started by Facebook), its mission is to dis-aggregate network hardware into modules and define open source software building blocks. As its name implies, TIP’s focus is telecom infrastructure specific in its work to develop and deploy new networking technologies. TIP members include more than 500 companies, including telcos, Internet companies, vendors, consulting firms and system integrators. Membership seems to have grown exponentially in the last year. During his opening keynote speech, Axel Clauberg, VP of technology and innovation at Deutsche Telekom and chairman of the TIP Board of Directors, announced that three more operators had joined the TIP Board: BT, Telefonica, and Vodafone. “TIP is truly operator-focused,” Clauberg said. “It’s called Telecom Infrastructure Project, and I really count on the operators to continue contributing to TIP and to take us to new heights.” That includes testing and deploying the new software and hardware contributed to TIP, he added. Jay Parikh, head of engineering and infrastructure at Facebook, echoed that TIP’s end goal is deployments, whether it is developing new technologies, or supporting the ecosystem that will allow them to scale. “It is still very early. Those of you who have been in the telco industry for a long time know that it does not move lightning fast. But we’re going to try and change that,” Parikh said. Artificial Intelligence and applied Machine Learning (AI/ML): will focus on using machine learning and automation to help carriers keep pace with the growth in network size, traffic volume, and service complexity. It will also work to accelerate deployment of new over-the-top services, autonomous vehicles, drones, and augmented reality/virtual reality. End-to-End Network Slicing (E2E-NS): aims to create multiple networks that share the same physical infrastructure. That would allow operators to dedicate a portion of their network to a certain functionality and should make it easier for them to deploy 5G-enabled applications. openRAN: will develop RAN technologies based on General Purpose Processing Platforms (GPPP) and disaggregated software. Edge Computing: This group is addressing system integration requirements with innovative, cost-effective and efficient end-to-end solutions that serve rural and urban regions in optimal and profitable ways. mmWave Network: This group is pioneering a 60GHz wireless networking system to deliver gigabits of capacity in dense, urban environments more quickly, easily and at a lower cost than deploying fiber. A contribution was made to IEEE 802.11ay task force this year on use cases for mmW backhaul. Open Optical Packet Transport: This project group will define Dense Wavelength Division Multiplexing (DWDM) open packet transport architecture that triggers new innovation and avoids implementation lock-ins. Open DWDM systems include open line system & control, transponder & network management and packet-switch and router technologies. System Integration and Site Optimization: The Working Group is focused on enabling carriers to more efficiently deliver new services and applications by using mobile edge computing (MEC) to turn the RAN network edge (mobile, fixed, licensed and unlicensed spectrum) into an open media and service hub. 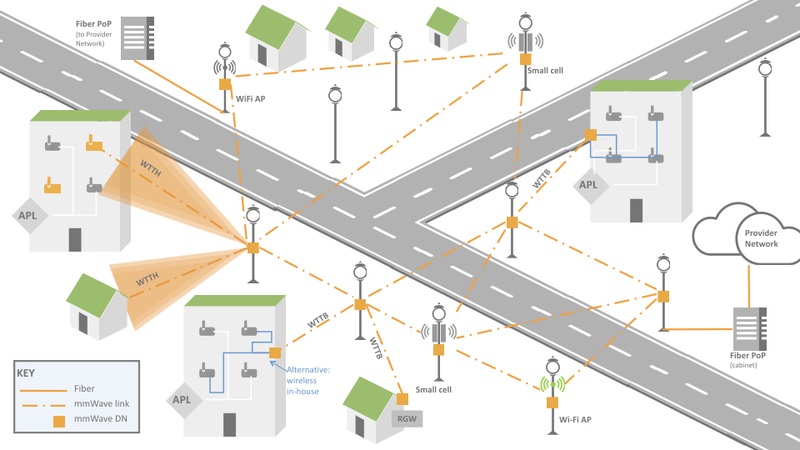 vRAN Fronthaul: The project is pioneering a virtualized RAN (VRAN) solution comprised of low-cost remote radio units that can be managed and dynamically reconfigured by a centralized infrastructure over non-ideal transport. Solutions Integration: This project group will develop an open RAN architecture by defining open interfaces between internal components and focusing on the lab activity with various companies for multi-vendor interoperability. The goal is to broaden the mobile ecosystem of related technology companies to drive a faster pace of innovation. A complete description, with pointers/hyperlinks to respective project/work group charters is in the TIP Company Member Application here. Also of note was the announcement of several new TEACs – TIP Ecosystem Acceleration Centers, where start-ups and investors can work together with incumbent network operators to progress their respective agendas for telecom infrastructure. TEACs are located in London (BT), Paris (Orange), and Seoul (SK Telecom). . TIP Community Labs are physical spaces that enable collaboration between member companies in a TIP project group to develop telecom infrastructure solutions. While the labs are dedicated to TIP projects and host TIP project teams, the space and basic equipment are sponsored by individual TIP member companies hosting the space. The labs are located in: Seoul, South Korea (sponsored by SK Telecom); Bonn, Germany (sponsored by Deutsche Telekom); Menlo Park, California, USA (sponsored by Facebook). Coming Soon Rio de Janiero, Brazil – to be sponsored by TIM Brasil. At this summit, Cable Labs announced it will soon open a TIP Community Lab in Louisville, CO.
“This is the opening of a system that runs radio as a software on top of general purpose processes and interworks with independent radio,” said Santiago Tenorio, head of networks at Vodafone Group. The project will work to reduce the costs associated with building mobile networks and make it easier for smaller vendors to enter the market. “By opening the system will we get a lower cost base? Definitely yes,” absolutely yes,” Tenorio added. “Opening up closed, black-box systems enables innovation at every level, so that customers can meet the challenges facing their networks faster and more efficiently,” said Josh Leslie, CEO of Cumulus Networks. “We’re excited to work with the TIP community to bring open systems to networks beyond the data center.” [See reference press release from Cumulus below]. Closing Comments: Request for Reader Inputs! What’s really interesting is that there are no U.S. telco members of TIP. Bell Canada is the only North American telecom carrier among its 500 members. Equinix and Cable Labs are the only quasi- network operator members in the U.S.
Rather than write a voluminous report which few would read, we invite readers to contact the author or post a comment on areas of interest after reviewing the 2017 TIPS Summit agenda. After the presentation, Sandhya Narayan of Verizon and Tom Tofigh of AT&T came up to the stage to answer a few audience member questions (there was no real panel session). The basic premise of CORD is to re-architect a telco/MSO central office to have the same or similar architecture of a cloud resident data center. Not only the central office, but also remote networking equipment in the field (like an Optical Line Termination unit or OLT) are decomposed and disaggregated such that all but the most primitive functions are executed by open source software running on a compute server. The only hardware is the Physical layer transmission system which could be optical fiber, copper, or cellular/mobile. Author’s Note: Mr. Sloane didn’t mention that ONF became involved in project CORD when it merged with ON.Labs earlier this year. At that time, the ONOS and CORD open source projects became ONF priorities. The Linux Foundation still lists CORD as one of their open source projects, but it appears the heavy lifting is being done by the new ONF as per this press release. A reference implementation of CORD combines commodity servers, white-box switches, and disaggregated access technologies with open source software to provide an extensible service delivery platform. This gives network operators (telcos and MSOs) the means to configure, control, and extend CORD to meet their operational and business objectives. The reference implementation is sufficiently complete to support field trials. ONF has transformed over the last year to be a network operator led consortium. SDN, Open Flow, ONOS, and CORD are all important ONF projects. “70% of world wide network operators are planning to deploy CORD,” according to IHS-Markit senior analyst Michael Howard (who was in the audience- see his question to Verizon below). 80% of carrier spending is in the network edge (which includes the line terminating equipment and central office accessed). The central office (CO) is the most important network infrastructure for service providers (AKA telcos, carriers and network operators, MSO or cablecos, etc). The CO is the service provider’s gateway to customers. End to end user experience is controlled by the ingress and egress COs (local and remote) accessed. Transforming the outdated CO is a great opportunity for service providers. The challenge is to turn the CO into a cloud like data center. A CORD like CO infrastructure is built using commodity hardware, open source software, and white boxes (e.g. switch/routers and compute servers). The agility of a cloud service provider depends on software platforms that enable rapid creation of new services- in a “cloud-like” way. Network service providers need to adopt this same model. White boxes provide subscriber connections with control functions virtualized in cloud resident compute servers. A PON Optical Line Termination Unit (OLT) was the first candidate chosen for CORD. It’s at the “leaf of the cloud,” according to Timon. 3 markets for CORD are: Mobile (M-), Enterprise (E-), and Residential (R-). There is also the Multi-Service edge which is a new concept. CORD is projected to be a $300B market (source not stated). CORD provides opportunities for: application vendors (VNFs, network services, edge services, mobile edge computing, etc), white box suppliers (compute servers, switches, and storage), systems integrators (educate, design, deploy, support customers, etc). CORD Build Event was held November 7-9, 2017 in San Jose, CA. It explored CORD’s mission, market traction, use cases, and technical overview as per this schedule. Author’s Note: NTT (Japan) and Telefonica (Spain) have deployed CORD and presented their use cases at the CORD Build event. Deutsche Telekom, China Unicom, and Turk Telecom are active in the ONF and may have plans to deploy CORD? This author questioned the partitioning of CORD tasks and responsibility between ONF and Linux Foundation. No clear answer was given. Perhaps in a follow up comment? AT&T is bringing use cases into ONF for reference platform deployments. CORD is a reference architecture with systems integrators needed to put the pieces together (commodity hardware, white boxes, open source software modules). Michael Howard asked Verizon to provide commercial deployment status- number, location, use cases, etc. Verizon said they can’t talk about commercial deployments at this time. Biggest challenge for CORD: Dis-aggregating purpose built, vendor specific hardware that exist in COs today. Many COs are router/switch centric, but they have to be opened up if CORD is to gain market traction. Future tasks for project CORD include: virtualized Radio Access Network (RAN), open radio (perhaps “new radio” from 3GPP release 15? ), systems integration, and inclusion of micro-services (which were discussed at the very next TC3 session). CORD is an open reference architecture. In that sense, CORD is similar to the ETSI NFV Architectural Framework, ONF SDN Architecture, and MEF LifeCycle Services Orchestration (LSO) reference architectures. As it is a reference architecture, it is not an implementation, and is maintained by the Open Networking Foundation (ONF), which merged with ON.LAB towards the end of 2016. OpenCORD is a Linux Foundation project announced in the summer of 2016. It is focused on an open source implementation of the CORD architecture. OpenCord was derived from the work undertaken by ON.LAB, prior to the merger with ONF in 2016. Part of the confusion is that if one visits the Linux Foundation projects page, CORD is listed, but the link is to the OpenCord website. Windstream Communications has become a corporate member of the Open Network Automation Platform (ONAP) Linux Foundation project, joining an open-source technology initiative for the first time. ONAP was formed through the merger of open source ECOMP (contributed by AT&T) and Open Orchestrator Project (OPEN-O), two of the largest open source networking initiatives. It was the big hit of the 2017 Open Networking Summit as we reported in this blog post. The ONAP Project is focused on creating a harmonized and comprehensive framework for real-time, policy-driven software automation of virtual network functions. ONAP includes participation by prominent networking suppliers and industry-leading service providers from around the world. It’s primary objective is to enable software, network, IT, and cloud providers and developers to rapidly create new services which can be monetized. The ONAP draft architectural principles, presented at their May 2017 meeting at AT&T Bell Labs in NJ, can be read here. “Combined with our rapid advances in SDN, Windstream’s participation in ONAP increases the value of our network for all of our customers, as we move to virtualization and cloud-based technologies that offer affordable and efficient next-generation services,” said Art Nichols, vice president of network architecture and technology for Windstream. “Traditionally, we have always worked with engineering groups and maybe a little bit with IT on the back side” in planning this kind of transition, Windstream’s Jeff Brown told Light Reading in an interview. Windstream has been informally monitoring multiple open source efforts and supporting the concept of open source for some time now, Brown told Light Reading. The move to more actively engage in orchestration through ONAP was driven by the growing influence of Windstream’s IT department in its transition to software-defined networking, he added. “In any type of industry forum, whether standards-based or not, you have to make the determination of what kind of resources you can dedicate to it,” Brown notes. Having just come out of meetings around MEF and proofs-of-concept for its 2017 event, he says the same discussions come up there. “We don’t have groups allocated that can do that type of thing and work with vendors,” he says. Windstream is the third North American service provider to join, after AT&T and Bell Canada Enterprises. ONAP now has 17 platinum and 22 silver members. The other service providers signed onto this Linux Foundation project include China Mobile, China Telecom, Orange, China Unicom and PCCW. Carol Wilson of Light Reading opined that Windstream is likely to start off with ONAP as more of an observer than a leader. “Although that may change over time,” Brown said. The next ONAP meeting is being held in China, and Brown is unsure whether the company will send a representative as a result. “That [long distance travel] would be highly unusual for us.” Brown added that joining ONAP and getting more involved over time is nonetheless important because of the need to speed up the process of getting to industry consensus, moving faster than the traditional telecom standards process.